Each event ran to the same approximate timings: registration at 11:00, draw at 11:30, first race at 12:00, and finish at about 16:00. All those participating had to be BR members (at least Silver) and have no sculling or rowing points. The host club usually put on food throughout the day, concluding sometimes after racing with a BBQ. You can download as archives the series poster (pdf) and entry form (xls). Five events out of the six planned took place. The fifth planned round at Hexham on 5 August was cancelled due to adverse weather. There are reports available of all the events - click on the name/link: Durham, Tyne United, Tynemouth, Tyne and Tees. Photos from the events are here on Facebook: Durham, TURC 1 and TURC 2, Tynemouth, Tyne and Tees. The points added up from the events at Durham, Tyne United, Tynemouth, Tyne and Tees (with Hexham cancelled) now give us overall results. First off in the women’s event it was very closely contended at the top of the league between Mothership and The Cake Crew. But the The Cake Crew managed to hold out to win overall by the narrow margin of 2 points. In the open class the gap was slightly larger at the top with Barking Mad dominating for the majority of the season and holding out there for victory by a huge 5 points margin over The Wrecks. 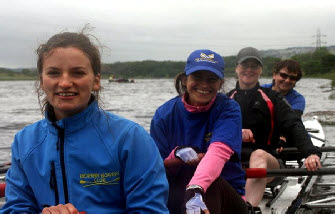 Good results for boats from Tees with the win in the women’s event and the top three in the open category! Final points for the very first season of the Sunday League are as below. We hope everyone who has taken part in the series have enjoyed themselves and will look forward to the return next year! Thank you to all the clubs that have helped make the series such a success! Without all of you the series wouldn't have been as fantastic as it was! Keep an eye out for the start of the series next year! 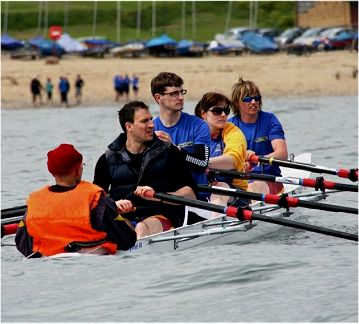 The NRC with help from British Rowing set up the Explore Rowing Sunday League series for summer 2012. There was an event the first Sunday of each month from April through to September. It was aimed at recreational rowers, novices, recent graduates of learn to row courses and those returning to rowing after a break. Each event was run over 200 to 300 metres on a round-robin basis, max five races each team, in the host club’s stable quads.